Okay, we've all read the comparisons between Clark Kent and Clark Savage, Jr., the men of steel and bronze, respectively. Superman's boots are rooted in wood pulp magazines. No argument. Period. Superman is a hero. He's the golden boy of black-haired, blue-eyed, cape-and-spandex-wearing comic book heroes. He's the oversized Boy Scout, as one or another super-villain has proclaimed. At its core, the concept of Superman is undaunted optimism. And by golly, he can fly. How cool is that? Sure, he can run faster than a locomotive, leap tall buildings, and pick and juggle automobiles. But he can fly. That's pretty darn cool. It's the flying thing. That's what is so magical about Superman. All the other stuff-- heat vision, X-ray vision, superstrength, giant arctic man cave -- is just gravy. The flying raised the bar for pop culture heroes. It encapsulates everything that is magical about Superman, that radiates that Kryptonian enthusiasm: Flying equals Optimism. A lot of the magic has been diluted over the years -- Superman has been handled in so many different ways over the years, good and bad: killed, revived, rebooted. There are highlights in the character's history that capture the magic. The Swan/Anderson art team is a highlight for me. It captured the magic. I remember when the first Christopher Reeve Superman movie was released. I drove to Nashville with my high school girlfriend the first weekend it was out. We ran into some other school friends. The first showing was sold out, so we all bought tickets for the next show. We all sat on the same row. My date said after the show, "When the credits at the beginning started to roll and the music was coming up, I looked along the row at all of your faces. You looked like kids at Santa's toyshop." Grant Morrison and Frank Quitely, a couple of Scotsmen, are quite a scripting-and-arting team for various comic book companies. Sometimes I like Morrison's stories, sometimes not. But he's always inventive and surprising. Quitely is always just amazing. They combined their powers for good on a DC comic, All-Star Superman. It doesn't fit into any particular continuity. It has all the familiar faces, like a comic-book equivalent of comfort food. They capture the Superman magic. The throwaway flares of cool ideas populate Volume One, which collects the first six issues, like unexplainable techno-stuff in a Jack Kirby Fantastic Four comic. The dynamic between Clark Kent and Lois Lane, between Superman and Lois, between Superman and Jimmy Olsen, between Clark and Lex Luthor -- wonderful. Magic. Morrison and Quitely recapture the sense-of-wonder delight of the immense cast of characters built up during the Weisenger years of stories by Edmond Hamilton, EandO Binder, and others -- when some other super-powered whatsit would appear inexplicably out of the blue or the future or another universe, and be accepted as just another super-powered neighbor in the galaxy. Best of all, with the undaunted optimism, what makes the Magic work best for Superman is his humanity. Morrison gets this perfect. If you don't have a tear in your eye at the end of Volume One, you clearly have read nothing in your life besides The Spider. 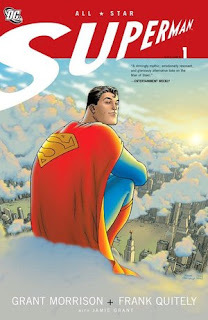 All-Star Superman. Volume 1. Magic.